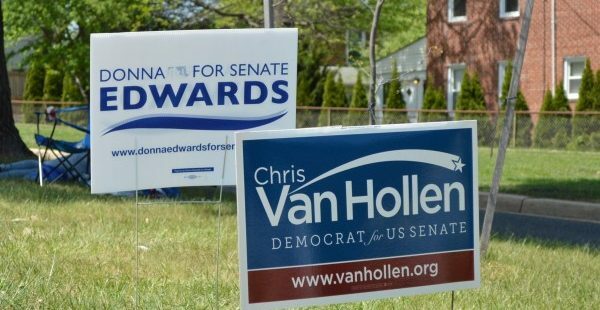 Democrat Chris Van Hollen Tuesday won a closely-fought primary battle for the Maryland Senate, easily defeating fellow House member Donna Edwards for the seat being vacated by Barbara Mikulski. Van Hollen had 53% of the Democratic vote to Edwards’ 39%. Addressing supporters from his election night headquarters in Bethesda, Van Hollen noted that Mikulski “understood you never forget the people back home,” and promised to do the same as the state’s next senator. Mikulski did not attend the celebration. For the past 30 years, winning the Democratic Senate primary is tantamount to election in November, especially in a presidential election year, when Maryland voters’ Democratic leanings are strongest. “Whether you’re from…the Baltimore area, whether you’re from the Washington suburbs, or from western Maryland, or southern Maryland or the Eastern Shore, I will fight hard for you every day in the United States Senate,” he said. Kathy Szeliga, a state lawmaker from Baltimore County, won the Republican Senate primary in a multi-candidate field with 36% of the vote. Maryland has not had an open U.S. Senate seat since 2006, when Democrat Paul Sarbanes retired, then Maryland’s longest serving senator. Mikulski matched his 30 years and, with her 10 years in the House of Representatives, has served longer in Congress than any woman in U.S. history. Van Hollen served in the Maryland General Assembly as both a delegate and a state senator before winning election to the House of Representatives in 2002. A resident of Kensington, Van Hollen represents Maryland’s 8th District, which includes parts of Montgomery, Frederick and Carroll counties. Before his election to the House, he worked as an attorney for 10 years in private practice, and before that he worked on Capitol Hill. House Minority Whip Steny Hoyer, D-Maryland, did not publicly endorse either candidate, but joined Van Hollen at his election night headquarters, a sure sign of his support now. Van Hollen recently won the endorsement of The Washington Post and Baltimore Sun editorial boards, as well as former Democratic presidential candidate and former Maryland Gov. Martin O’Malley. Van Hollen said the country has “a lot of work to do” to address issues of economic equality, gun violence, mass incarceration and climate change. But in order to effectively address these issues, Democrats will need to win both the White House and a majority in the Senate, he said. Maryland Delegate Al Carr, D-Montgomery, was working the polls at Kensington Town Hall, his home voting location, in support of Van Hollen. Carr said Edwards and Van Hollen are both strong politicians, but he thinks Van Hollen will be able to “deliver” for voters in the Senate. At Van Hollen’s election night headquarters, supporter Sam Witten, a lawyer from Bethesda, said Van Hollen has integrity, a strong record of constituent service, and is willing to reach across party lines. Witten, 59, said he volunteered in Baltimore and Takoma Park Tuesday in support of the candidate. Edwards, who highlighted her experience as a black woman and a single mom, fell short in her attempt to become the second black woman to serve in the U.S. Senate. Edwards called Van Hollen after the results to congratulate him. Edwards has represented the state’s 4th District, comprised of parts of Anne Arundel and Prince George’s counties, since 2008. She was the first African American woman to represent Maryland in Congress. Herman Flora, of Hyattsville, said Tuesday morning he voted for Edwards because he feels black voters need greater representation. The contrast between Van Hollen and Edwards split Maryland voters and provided a tight race until the final weeks before the primary. A University of Maryland-Washington Post poll conducted in late March and early April found the race was a dead heat, with Van Hollen holding a four-point lead over Edwards: an advantage within the survey’s margin of error. But a Monmouth University Poll last week showed Van Hollen pulling ahead of Edwards 52-36 percent. The UMD-Washington Post poll also showed a sharp racial divide in the race, with likely white voters supporting Van Hollen by a 2-1 margin while black voters supported Edwards 3-1. Maryland will elect a senator in the Nov. 8 general election. “Together we’re going to go forth from this evening and win the general election and we’re going to be part of a new Democratic majority in the United States Senate,” Van Hollen said.